Charity Donations: Is there an App for that? 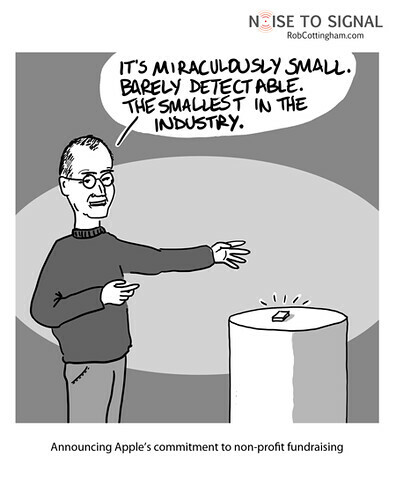 Note From Beth: While I posted this guest post on Huffington Post and was doing a bad job of photoshopping Grinches and Jobs, my colleague, created this cartoon and wrote this post about Apple’s iPhone donation policy. If you think Apple should change its nonprofit unfriendly policy about in-app donations on the iPhone, please sign the petition and share with your friends. Meanwhile, I’m going Android shopping. If you think of Apple, you may well think of great design, fant­astic usab­ility, innov­a­tion and just plain cool­ness. But one thing you prob­ably don’t think of is philanthropy. You would think that char­it­able giving would be a no-brainer. A built-in payment mech­anism, beau­ti­fully simple UI, count­less ways to cre­at­ively employ things like loc­a­tion… it should add up to a huge leap forward for non-profits hoping to raise funds. But before an app can raise any money, it has to clear a hurdle: the iPhone App Store. Only approved applic­a­tions can make it onto iPhones (at least, the ones that haven’t been jail­broken), and approval hasn’t been forth­coming for char­it­able apps. The restric­tions on just what kind of pitch you can make, and how, are remark­able. You can’t promise to do any­thing outside the app itself (as an organ­iz­a­tion that prom­ised to plant a tree for every app they sold dis­covered). And you can’t have in-app dona­tions… so there goes nearly all of the benefit of using the iPhone for fundraising. The 30-per-cent cut Apple takes from any trans­ac­tion through the store is just the coup de grace in deter­ring iPhone-enabled donations. Non-profit tech vis­ionary Beth Kanter has taken up the cause of con­vin­cing Apple to change its tune. (She’s also announced her inten­tion to bail on her iPhone once the con­tract expires, and make the jump to Google Android, if things don’t change.) An online peti­tion backing that pos­i­tion has already garnered more than 1,300 signatures. Apple is, after all, the company of cool… and what’s more, the company of helping people do amazing things with extraordinary tools. Imagine if making char­it­able giving pos­sible was just their first step… and if Apple brought the same degree of ima­gin­a­tion and bril­liance that gave us the sim­pli­city and power of OS X, iMovie and iOS to bear on philanthropy. I’m going to be mulling over that pos­sib­ility. And I’m also going to be pricing Androids while I wait. For 20 years, Social Signal president Rob Cottingham has worked with senior strategic levels of government, business and advocacy organizations to help them engage with audiences – in both the digital and offline worlds. He is a talented writer and cartoonist. Apple’s stated intention to protect its users from being scammed rings false. Why must it protect its users from being scammed by non-profits – but not from being scammed by for-profit app developers? Apple already requires that developers go through a screening and approval process. If the company must tighten up its due diligence steps, so be it, but by precluding donations to nonprofits (and by requiring large transaction fees), Apple locks the iPhone permanently into the expensive electronic toy status and keeps it from enabling social good. Thanks for the thoughts, Paul and ami. Paul, I enjoyed your post. And ami, I agree that Apple would rightly want some assurance that funds are actually reaching the charities that apps purport to be helping. But Jake Shapiro points out there are any number of options for gaining that assurance… and that others have already developed workable solutions. This is where I keep hoping that Apple may reverse itself in spectacular fashion, as it’s done before… most notably by developing the iPhone after years of snubbing the hand-held market. Suppose they shifted from today’s hard-line attitude and instead developed something along the lines of the iTunes of charitable giving? Charitweet are trying to achieve the same objective with a petition, over four years after your attempt Beth. Thanks Howard, maybe things have changed enough at Apple for this happen ..